Falkirk came from behind to move third in the Championship, adding to the misery of bottom club St Mirren, who remain without a league win this term. Lewis Morgan fired Saints ahead but the visitors had Jack Baird sent off for throwing a punch before the interval. Lee Miller levelled early in the second half, turning in a low cross from Myles Hippolyte, via the post. Bob McHugh and Hippolyte then earned the Bairns maximum points with strikes inside the closing 12 minutes. St Mirren, without a point since October, started in bright fashion and Kyle McAllister had an early effort that drifted wide of Danny Rogers' goal. And when the breakthrough came, it was a goal of outstanding quality. John Sutton knocked the ball down into the path of Morgan, who took one touch and blasted the ball high into the net from 18 yards. The St Mirren defence were coping admirably with all that was being thrown at them before Baird was shown a straight red card after a clash with Falkirk striker Miller. 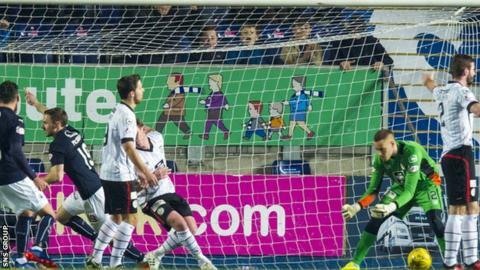 Within two minutes of the second half Falkirk were back on terms, with Miller applying the finishing touch. Despite being a man down, St Mirren looked dangerous on the break but they could not find a way through. Falkirk eventually made their personnel advantage count with McHugh on target from close range after good work by Miller. And victory was secured when Hippolyte evaded a couple of challenges to create space to crash in a shot from 12 yards and lift his side up two places in the table. Match ends, Falkirk 3, St. Mirren 1. Second Half ends, Falkirk 3, St. Mirren 1. Foul by Gary Mackenzie (St. Mirren). Lawrence Shankland (St. Mirren) wins a free kick on the right wing. Substitution, St. Mirren. Calum Gallagher replaces Kyle McAllister. Attempt missed. Robert McHugh (Falkirk) right footed shot from a difficult angle on the right is close, but misses the top right corner. Goal! Falkirk 3, St. Mirren 1. Myles Hippolyte (Falkirk) left footed shot from the centre of the box to the bottom left corner. Attempt saved. Gary Mackenzie (St. Mirren) right footed shot from the centre of the box is saved in the centre of the goal. Goal! Falkirk 2, St. Mirren 1. Robert McHugh (Falkirk) right footed shot from very close range to the centre of the goal. Assisted by Lee Miller. Corner, Falkirk. Conceded by Scott Gallacher. Attempt saved. Robert McHugh (Falkirk) right footed shot from the centre of the box is saved in the bottom right corner. Substitution, St. Mirren. Lawrence Shankland replaces John Sutton. Substitution, Falkirk. Scott Shepherd replaces James Craigen. Attempt saved. Myles Hippolyte (Falkirk) right footed shot from outside the box is saved in the centre of the goal. Corner, St. Mirren. Conceded by Luca Gasparotto. John Sutton (St. Mirren) wins a free kick in the attacking half. Attempt missed. James Craigen (Falkirk) left footed shot from the centre of the box is too high. Substitution, St. Mirren. Jordan Stewart replaces Rocco Quinn. Corner, Falkirk. Conceded by Rocco Quinn. Attempt missed. Aaron Muirhead (Falkirk) header from the centre of the box is too high following a corner. Corner, Falkirk. Conceded by Gary Irvine. Myles Hippolyte (Falkirk) has gone down, but that's a dive. Attempt saved. John Baird (Falkirk) right footed shot from the centre of the box is saved in the top centre of the goal. Goal! Falkirk 1, St. Mirren 1. Lee Miller (Falkirk) right footed shot from the centre of the box to the top right corner. Assisted by Myles Hippolyte. Myles Hippolyte (Falkirk) wins a free kick in the defensive half. Second Half begins Falkirk 0, St. Mirren 1. Substitution, Falkirk. Craig Sibbald replaces John Rankin. First Half ends, Falkirk 0, St. Mirren 1. Attempt blocked. Myles Hippolyte (Falkirk) left footed shot from outside the box is blocked.